Wisconsin's Republican dominated Senate; without any of its Democrat lawmakers; voted Thursday to strip just about all of the collective bargaining rights from the state's public workers. The Democratic Senators purposely stayed out of the state to block a vote and the Republican majority sidestepped that by renaming the measure as merely a procedural question rather than a standard piece of substantive legislation. Thus, both parties resorted to unusual and dramatic "tactics" to either destroy or preserve unions. This procedural move by the Republicans ended an incredibly acrimonious standoff over labor rights and it secured a key victory for Republicans who have targeted unions nationwide. After the Senate action, Wisconsin's Assembly then passed Governor Scott Walker's radical attack on the rights of free assembly and rights to bargain collectively by a 53-42 margin. There was no Democratic support for the measure and there were four no votes from the GOP. A large crowd of protesters in the capitol gallery exploded into screams, hollering, "Shame! Shame! Shame!," as the Republican lawmakers departed the chamber. Public employees have not only lost most of their decades long standing rights of public assembly and collective bargaining, they have also lost approximately eight (8%) percent of their income. 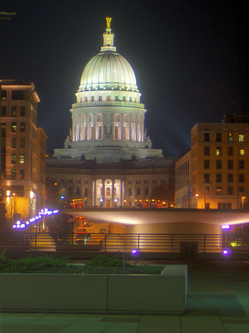 Walker, the new Governor, sparked a national debate over labor rights for public employees. This is considered a key victory for Republicans; many of whom have specifically targeted unions in general and public workers in specific. Very similar bargaining restrictions are "on the table" in Ohio. The Wisconsin debate resulted in tens of thousands of protesters in the state Capitol for weeks with rallies and demonstrations against Governor Walker's anti-union legislation. Three interesting aspects of this story have not been sufficiently publicized: (1.) the teacher's unions and most public sector unions were specifically included in the new legislation limiting their rights. These unions opposed the new governor in the last campaign just months ago. The Police and Firemen's unions were specifically excluded from this legislation with their rights remaining intact and they supported this new governor. Even so, the Police and Firemen may be next on the target list. (2.) Wisconsin's budget crisis is nowhere near as bad as most states and the union busting campaign will do very little to fix what problems they do have, but it makes for great political theater and it plays to the radical Republican and Tea Party supporters of the new governor. And, (3.) in Indiana where some lesser such modifications to worker rights was tried, it has not saved the promised money. Public employees have still lost jobs, income, and benefits. It did not fix the budget shortfalls. While outsourcing of public works and services did save money here and there by hiring people for less money and less benefits, the companies that provided these cheaper workers reaped impressive profits such that no real savings took place. Florida; because of its long standing Southern roots and its philosophies of trying to attract large businesses here has never been a particularly strong union state, but this potentially national trend should be followed closely. Unions not only bargain for salary, they bargain for many things including safer working conditions. In Wisconsin, for example, one of the affected unions protects nurses and a large part of their recent bargaining involved limiting the number of cancer patients a nurse is responsible for at any given time. The issue was not salary, it was patient safety.